Imagine biting into the perfect strawberry chocolate truffle from a ridiculously expensive box of chocolates but in cake form. That is what I was going for when my daughter requested a strawberry chocolate cake for her twelfth birthday celebration. I looked all over the internet and searched through my cookbooks, but did not quite find what I had in mind. 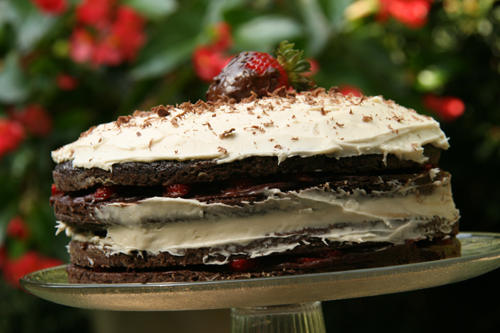 So I pieced together recipes from three different sources to get exactly what I was imagining…a chocolate strawberry truffle in a lovely slice of cake. 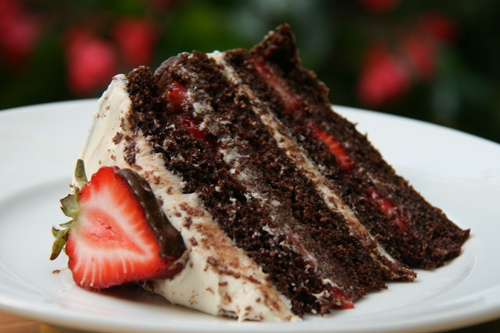 The cake is rich, moist and chocolatey, with a strawberry chocolate ganache slathered on between layers, sliced strawberries, and a white chocolate cream cheese frosting. Oh, did I forget to mention the obvious? Chocolate dipped strawberries are the garnish and also get to be served on the side. A pretty special birthday cake…wouldn’t you say? Birthdays are not taken lightly here, figuratively or literally. My mom believed in the all-week birthday celebrations when I was a kid. There were several occurrences that happened with each and every birthday; First and foremost, there was always some kind of party with friends over the weekend, then there was a separate family birthday dinner in which we got to choose everything from the main course to the dessert and finally, don’t take this lightly…my mother cleaned our rooms and made our beds on our birthday. Pretty sweet, right? I know. I was spoiled, but not necessarily with stuff. Mostly, I was spoiled with the things that mattered…my parents’ time and effort. This birthday week celebration let me know that because I was born their lives were better, not more difficult or more expensive or demanding. Sometimes it’s easy to fall prey to the mentality that things were simpler then, and that we just don’t have the extra time to spend with our kids because life is moving at lightning speed. When I ask my parents about the speed of life when they were parenting, I realize it doesn’t sound that different. There was baseball, basketball, volleyball, piano, clarinet, Blue Birds, Boy Scouts, etc. They had jobs, had to get dinner on the table and there were no salads in bags, or pre-chopped vegetables or going out to dinner on a weeknight. You get my drift. I’m not saying each one of us doesn’t have it a little harder in some way or a lot harder due to life circumstances, but what I am saying is that no matter the speed of life, kids, at any age, need to feel special and need to know that we actually WANT to spend time with them. It’s about playing board games on the kitchen table, sitting down to a meal together and celebrating birthdays ALL WEEK. Kids still need to feel important to us even if life is flying by and even if our responsibilities seem insurmountable. This cake is time consuming. You may want to make it a day ahead of when you plan to serve it. IMPORTANT!!! Make 1.5 times this recipe if you want to frost the sides of the cake as well! Some people like the layers to show since they are so pretty but mine weren’t so pretty and more frosting would have been GRAND! To Make the Cake: Grease the bottoms of two 9×2 inch round cake pans (leave the sides uncoated and line with parchment paper for nice, flat cakes…I did NOT do that and that is why makes layers look rounded and the whole cake looks a little topsy turvy). Heat oven to 350 degrees with a rack in the bottom third of the oven. In a small bowl, whisk together cocoa powder and hot water. Then cover with plastic wrap and let sit for 30 minutes so the mixture comes to room temperature. Once cooled, pour it into the bowl of your stand mixer. Add the oil and egg yolks to the mixing bowl and beat with the whisk attachment, starting on low speed and then increasing to medium until mixture resembles buttercream. Beat on medium for 1 minute or until shiny and smooth. Scrape down the sides of the bowl and then beat in the vanilla for a few seconds. 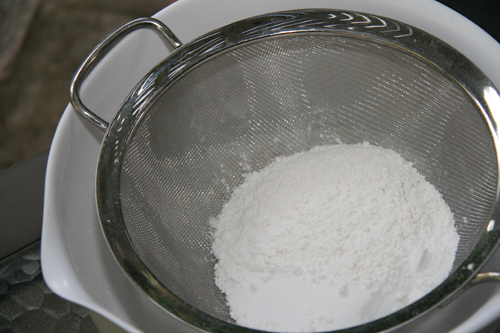 In a medium bowl, combine the cake flour, all-purpose flour, sugar, baking powder, baking soda and salt and sift together. Put 1/2 of the dry ingredients into the wet ingredients and mix on low speed until combined. Put the last 1/2 in and beat on low speed, scraping down the bowl. Raise the mixer speed to high for 1 minute. Scrape down the sides of the bowl-the mixture will be very thick. On low speed, add the egg whites and gradually increase the speed and beat at medium-high speed for two minutes. The batter will now resemble thick soup. Transfer the batter to the prepared cake pans. Bake for 25-30 minutes or until a toothpick inserted in the centers comes out clean. Remove the cakes from the oven and immediately run a small metal spatula or knife between the sides of the pans and the cakes. Invert the cakes onto wire cooling racks that have been lightly sprayed with cooking spray. Remove the parchment from the bottom of the cakes and then invert them onto the racks so they are right side up. Cool completely. I wrap each layer in plastic wrap after it is cooled completely and freeze for about an hour. This will help make it easier to slice each layer in half later. 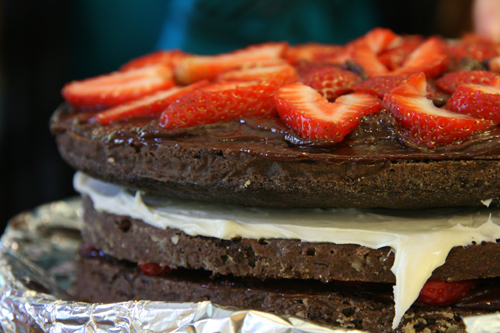 While cake is cooling prepare Chocolate Strawberry Ganache: Combine cream and jam in heavy large saucepan. Whisk over medium-high heat until jam melts and mixture comes to a low boil. Don’t walk away, the cream can burn quickly. Add chocolate and remove from heat. Whisk until chocolate melts and mixture is smooth. Refrigerate ganache just until thick enough to spread, whisking occasionally, about one hour. 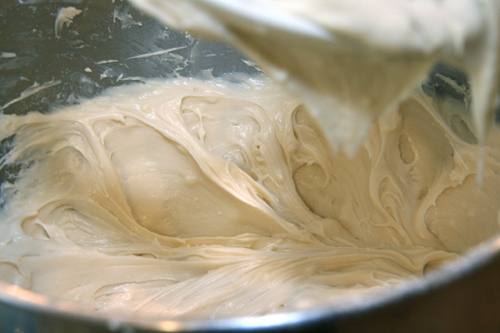 While ganache is refrigerating, make one batch of white chocolate cream cheese frosting. You will make a 1/2 batch later! Take the cakes out of the fridge and slice horizontally in half. Melt the white chocolate in a microwave safe bowl for 1 minute. Stir. If it is not melted, keep cooking for for 30 second intervals, check and stir. Over heating white chocolate will cause it to seize up so if it’s almost melted, just cook another 10 seconds or so. Beat butter and cream cheese together in the bowl of a stand mixer fitted with a paddle attachment (on medium then high speed to get fluffy). Add slightly cooled melted chocolate and combine. Add sifted powder sugar and vanilla and beat on high until creamy and fluffy. To assemble the cake: Place the bottom layer of your cake on your cake stand. I usually put thin strips of foil all around the outer edge of the cake stand so that any drips from the ganache are caught by the foil. I remove the foil when I am done frosting the cake. Brush 1 T. of Framboise over the first layer of cake. Then spread the ganache thickly over the bottom layer of cake and then place sliced strawberries in a circular pattern on top, one layer only of strawberries. Put the second cake layer on top and spread with white chocolate cream cheese frosting. 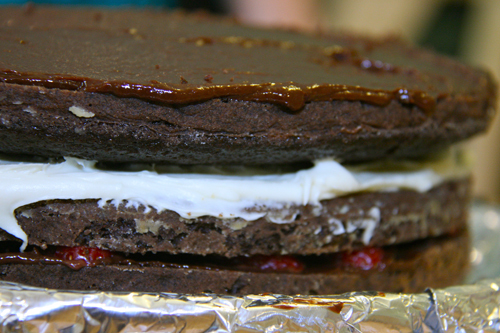 Place the third layer on the frosting and repeat with the Framboise, chocolate ganache and sliced strawberries. Place the last layer on top and frost with the cream cheese frosting. O.K. people…this is where you learn from my mistakes. I did not have enough frosting for the sides and ended up with a lopsided cake so it was not so pretty from the sides. If you are going to frost the sides, I highly recommend refrigerating your cake for an hour or two BEFORE doing so. Just before taking the cake out of the fridge, make your extra 1/2 batch of frosting and then frost the sides of your cake. The refrigeration allows the ganache to set-up and therefore it won’t smear when you are frosting the sides of your cake with white frosting. Dip whole strawberries in melted chocolate chips and refrigerate for 15 minutes. 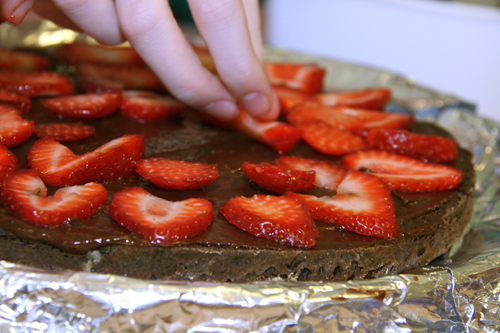 Push one strawberry or more…use your artistic side…atop the cake. I shaved a bit of chocolate over the top for finesse from a leftover chocolate Easter bunny we hadn’t eaten. My mouth drools a little bit more with each blog post. This by far is the most yet! Chocolate & strawberries are the best combination ever!! (Antioxidents & fruit) 😎 Can I pay you to make this for my birthday? We have to get together and make something delicious. I just love this. My mama made birthdays special too (in fact, tomorrow I’m sharing my go-to bday dinner request on my blog). So, my question is… what is your daughter’s entire bday dinner request? 12 is a big year! Guess what? It’s Lobster with drawn butter (OH MY! ), mac n’ cheese and a fruit salad. Brioche rolls are sometimes requested as well. I’m a sucker for a budding foodie! 🙂 Luckily for her, she is a very petite thing so the dinner calorie explosion is just fine for her. Hi, Geni. I imagine that this cake would taste amazing and would be appropriate for any birthday or other special celebration. The week-long birthday events in your family are a great inspiration, though I have a friend who tries for a month-long celebration around hers (of course, she was born in January, and you can get away with that in Chicago and Wisconsin, with little after new years but snow and cold!). Beyond that, it could become a birthday-season of three months…. I don’t think I could get away with a month long celebration, but it’s always worth a try! Thank you for stopping in. This cake looks so good its ridiculous!! I love the week long birthday idea. Your reasoning for it is so sweet. Thank you. I hope my kids look back and have the same great memories I do. The cake looks so scrumptious! I love that you mix and match recipes. I do the same thing when I can’t find what I’m looking for. What is your other favorite? Thank you. Geni, this. looks. amazing. I think I need more layer cakes in my life. Or maybe just THIS layer cake. NOM!! Thank you! This is a great one to have in your repertoire! Geni, this cake have lots and lots of layers of goodies…love the way you prepared it and looks absolutely delicious, so moist and full of flavor…lovely cake! Wow, this cake takes the cake. Yummy, keep up the great blogs. You are entertaining and share great recipes. Geni this looks so decadent and I can hear it calling my name. I think the butter cake looks very good too. I didn’t look at the post yet just the picture and it looks like a juicy pound cake. I love strawberries and chocolate and I would love for someone to make this for me. Usually I say how I would love to make something for my husband, but this looks too good. I want it all. Thanks also for frequenting my blog. I appreciate all your comments. Thank you for stopping by as well! Oh my goodness gracious me! This cake is to die for! I know what you mean about birthdays, except my mother was also a “gift giver”. She said that she just loved watching us open presents and seeing the reaction on our faces! We would typicall have a small party with friends and then a small get together (more of a home cooked meal) with the family. Now my family wasn’t rich or anything, and it wasn’t until I got older that I really appreciated that my parents basicallty worked 2 or more jobs to make sure we had good birthdays/Christmases! Thanks for the great great post, I’ll definitely be trying this cake out soon! We understand a lot better as adults how much our parents sacrificed. We are lucky they did. Thanks for the comments. This looks divine! I totally agree with you about making kids feel special…sometimes, I don’t think it happens enough! Hello! So glad you found my blog…how did you find it? Thanks for the comments. I am in love with this cake. Your pictures are GORGEOUS! It looks so good, I want to make this right away! Hi; I’m about to try this delicious looking cake but need some clarification. The recipe says 4 eggs + 2 egg whites but then it says to start blending the yolks. So is it 6 whole eggs altogether or just 4 eggs + 2 egg whites? Also it says to grease the bottom of the cake pan and use parchment paper for the sides but later goes on to say “remove the parchment from the bottom of the cakes” so which is it? Should parchment paper go on the bottom of the cakes or not? Also- why would you make two separate batches of frosting when doing the sides- wouldn’t it make more sense to make all the frosting at once and put 1/3rd of it aside to use on the sides? Thanks! Came across this yummy recipe while looking for something special for my girlfriends, who are coming over for an afternoon of knitting and drinking! A question came up when I added the water to the cocoa. All I got was one large clump of cocoa. Had to add water to release it from it’s cage! No matter, the cake is wonderful and I can’t wait to serve it. Thanks. Oh, good to know. I’ll look into the recipe again…it’s been awhile since I made it. I should have an answer shortly. Sorry it was a bit unclear and glad to know it worked out for you.